So in just one day it will be April, which I’m totally psyched about because it’s my favorite month (being my birthday month and all). I didn’t try as many new products in March as I did in February, but I still managed to find some standouts to talk about. The first thing is probably my favorite makeup purchase ever, the Anastasia Beverly Hills Contour Kit. I wrote a rave review on it here, and I’m happy to report I’m still totally smitten. I’ve used it pretty much every day I’ve worn makeup (I skipped it for a week when I had to get up at 5am every day, but that’s it). I’ve been using every shade in the palette, and looking back I don’t know how I went so long without buying this. Another palette I’ve been reaching for almost daily is the Tartelette Amazonian Clay Matte Eyeshadow Palette (full review & swatches here). I’ve been loving the low-key look of matte eyeshadows lately, so this palette has gotten a lot of use this month. All of the shadows perform so well, but I’ve been mostly using the colors in the second and third rows. My last makeup favorite is the NARS Pure Radiant Tinted Moisturizer. I was trying so hard to resist buying this until my Laura Mercier Tinted Moisturizer ran out and ultimately failed, but I’m glad to have both on rotation now because they’re quite different. The NARS option gives amazing coverage, so it’s one I’ve been reaching for on more questionable skin days. It lasts all day on me without needing touching up - I wore this every day when I was in DC (see the other beauty bits I packed here) for full days of museum exploring and monument touring. It also gives an amazing glow to the skin without being greasy in the slightest. Speaking of a glow, two skincare favorites this month have been the amazing new face masks by Glossier: the Mega Greens Galaxy Pack and the Moisturizing Moon Mask. I wrote a review on the pair here, and I’ve continued using them at least once a week since buying them. My skin has been so much more manageable and just looks healthier now that I’ve been using all of Glossier’s products. Finally as a non-beauty favorite, I’ve got a pair of tiny gold bar stud earrings. I got mine from Forever21, but I’ve seen them all over the place (especially Etsy). I’ve really been loving more minimalistic jewelry this year, so these are absolutely perfect. If you read my Simple Earrings post from a few months ago, you’ll know I don’t feel complete if I don’t have my earrings in, so these have been a nice addition to just throw on as I’m running out the door because they’re so simple that they go with everything. 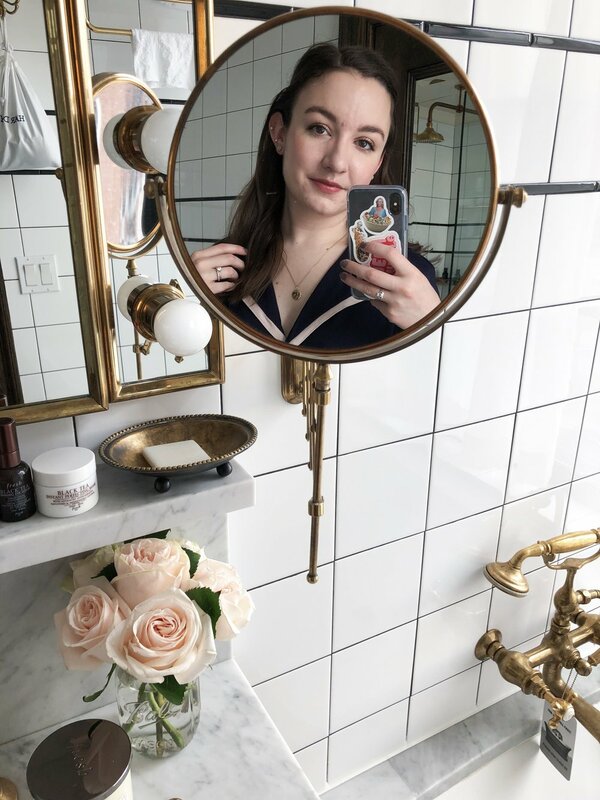 I’m already looking forward to writing my April favorites - I’m anticipating some new favorites to tell you about since my birthday is this Friday. What have you been loving this month?